In Running Low On Rage, nooneofanyimport explains the problem. I expect one reason nooneofanyimport‘s blog is popular is because she expresses well what many of us think and feel. And thanks to what our elites have done here of late, there is — or at least there was — a lot of rage out there. 2. a fit of violent anger. 4. violence of feeling, desire, or appetite: the rage of thirst. 6. ardor; fervor; enthusiasm: poetic rage. 7. the object of widespread enthusiasm, as for being popular or fashionable: Raccoon coats were the rage on campus. Please note that “rage” can also be used as a verb. Here we have provided only the definition of the noun. Look carefully at that last “archaic” definition, insanity. Anger has its place. Even Jesus occasionally found his voice in anger, but we cannot devote our lives to rage and still expect to make any sense. At some point we must set our rage aside and put love in its place. For the sake of our neighbors, our friends, and our families, we must consider the consequences that must result when we each do not do our part to build up our republic. Our foreign policy lacks direction. Our national defense begins to crumble. Our neighbors, our friends, and our families soon lack the ability to protect both their property and their persons. The very concept God-given freedom slowly fades from the understanding of our children, grandchildren, and great-grandchildren. In a land where government is of the People, by the People, and for the People, we must each learn to treat our duties as citizens as a voluntary public service, an obligation we take up for the sake of our neighbors, our friends, and our family. To save our republic, we must approach the work of government the same way our forebears built barns (see here, here, and here). We each choose our attitude to politics. We can choose rage or kindness, neighborly love or hatred, greed or charity…. We can allow politics to bring us together in common cause, or we can use victory at the polls to decide how we divide the spoils, the taxes paid by our neighbors. We can choose to raise a barn, or we can set our neighbor’s barn afire. On the first Tuesday of November 2011, Virginia will hold a general election. In the months ahead, conventions and primaries will precede those elections. Do you care about your neighbors, your friends, and your family. Then take the time to learn how our political system works. In praise to our Creator, please do your part to raise up our republic. NOTE: At some point every analogy breaks down. As the result a barn raising, the owner of a farm benefits from the volunteer labor of his friends, neighbors, and relatives. 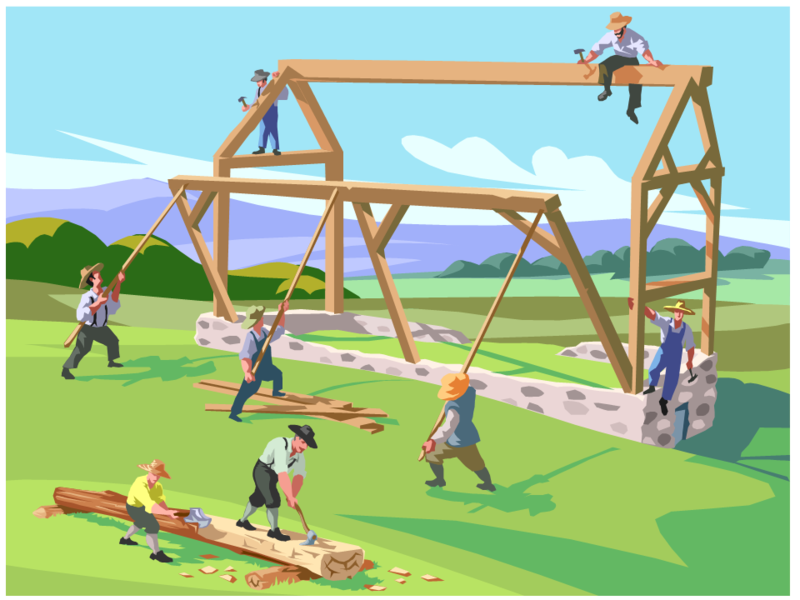 So using a barn raising as a model for good government might suggest to some that we should use government to provide charity. Think again. The participants in a barn raising are volunteers, not forced labor. Similarly, when take part in politics, the success of our endeavors requires that we be willing volunteers, not forced. If we want to keep our republic, we must each instill within ourself — with prayers to God — the right attitude. Given the chaos of our times, I suspect your blog is more important to at least a few people than you might guess. Self-government requires self-control. That’s why republics do not function well in times of rage (or outrage). So we must find a way to set aside our anger, and your blog helps. When we discuss our circumstances, debate our opinions and admit our fears — when we identify our problems and consider the various solutions — we calm ourselves. You are such a kind and patient soul, Tom. Perhaps “outrage” would have been the better term for me to use. I do take poetic license though, and rage sounded better. I hope to do some good, but I don’t believe for a minute that I’m making much difference. Now that the sense of urgency has left me, the only reason I’ll keep writing is fun. One day, when we aren’t constantly moving, perhaps I will be able to make some changes, and build some barns.